The Orton family (L to R) Margaret, Kathy, Tim and Frank at the Otter Lake base camp. When you are in the guide and outfitting business you deal with many different individuals with a variety of personalities. Some you will like better than others then there are those with whom you just click and become lifelong friends. Tim Orton is one of those people. During my time in the business we had over 700 different clients and I will have to say that most were really good people and a pleasure to be around. But like all outfitters, we had a core group with whom we became good friends and still keep in touch. I met Tim before I started guiding. I was out at my soon to be partner’s (Brent Jones) taxidermy shop during the fall of ’78 or ‘79. Tim and Mike Ebner were in Alaska on a hunting trip and had stopped by Brent’s. Tim was much younger than Mike and I even thought at the time he looks pretty young to be going on guided hunts. He seemed like a nice enough guy and I ended up dropping Mike and Tim off at their hotel that afternoon. When we formed AAA Alaskan Outfitters in December, ’83, Tim was one of the first hunters that Brent booked for our spring brown bear hunt at Cold Bay. In fact he became the first hunter that I guided for AAA. That was the first of ten different hunts that Tim took with us. He took more hunts than any other hunter that hunted with AAA followed by Matt Caldwell who hunted with us nine times. I personally guided Tim on all but two of his hunts. Tim is from Walker, Minnesota. His dad started Orton Oil, an oil distribution business where Tim worked during high school and college and later become his dad’s partner. Not long after that they opened a chain of gas/convenient stores which were very successful. Tim with his 10'2", 28 5/16 Boone and Crockett brown bear. We found out that Tim had a “Super Cub” for sale and we were in the market. We worked a deal during the spring of ’85. We traded a sheep/goat/moose hunt plus some cash for the cub. Then on July 18th of that year I crashed that cub. See “The Worst Day of My Life” for more details. Tim’s combo hunt took place in September ’85. I had unsuccessfully attempted to take a big ram on the Canyon Creek glacier with client Kurt Jaeger from Liechtenstein in ’84. The following year I made it my goal to get that ram for Tim. After three attempts and many shots the ram escaped only to be killed that winter by a wolverine. Paul Claus ended up killing the wolverine while it was on the sheep kill. The sheep was a 41 incher and scored 165 B&C points, one of the largest ever taken in our Wrangell Mountain sheep area. It had a bullet hole in its horn from one of Tim’s shots. Tim ended up only taking a mountain goat on that hunt and would come back the following fall and with one shot harvested a beautiful 40” ram. I think after that sheep hunt was when I considered Tim a really good friend. Tim with his 9" mountain goat taken in '85. I'm holding the 41" ram that got away. Notice the bullet hole in the left horn. The ram scored 165 B&C. Paul Claus brought the head into Anchorage to show me. It was mounted and is hanging at the Ultima Thule lodge. During the spring of ’86 I was on a mission to replace my .375 H&H that had burned up in my airplane crash. Tim had given Brent a call to check on one his mounts and asked how I was doing. Brent told him I was fine and in fact was out looking for a new .375 H&H. Tim knew the gun had burned. He told Brent to tell me to get whatever gun I wanted and send him the receipt and he would reimburse me. Tim was just that kind of guy, very generous. I was interested in the Sako .375 H&H “Hunter” model and Boondocks Sporting Goods in Eagle River had it with either the wood or fiberglass stock. Since Tim was paying for it I chose the one with the wood stock because it was $400 cheaper. Tim said he couldn’t believe I didn’t get the fiberglass stock so that Christmas I received a letter from Brown Precision, Inc. , a custom gun maker, telling me that Tim had authorized them to restock any rifle of my choice with a custom Brown Precision Kevlar stock. So I, trying to be frugal, ended up costing Tim $200 more than if I had purchased the more expensive rifle. Later on he sent me a custom Brown Precision .257 Ackley Improved rifle along with a letter inviting me on an all-expense paid mule deer hunt in Montana. Again, Tim was just that kind of guy. I had a blast hunting with him on that hunt. Tim with his beautiful 40" Dall ram taken in '86. Tim was interested in another brown bear so he booked to return to Cold Bay the spring of ’88. He was looking for a bigger bear which was going to be tough to do. It was close to the end of his hunt when we made an attempt on a bear approaching 10 and a half foot. The bear got away and Tim, unfortunately, left empty handed. I guided John Bermen from Utah to that bear four days later. It was 10’5” and scored 29 6/16 SCI and 28 11/16 B&C, so Tim came close to getting a bigger bear. He returned the spring of ’90 and took a 9’5”. That was his last brown bear hunt. 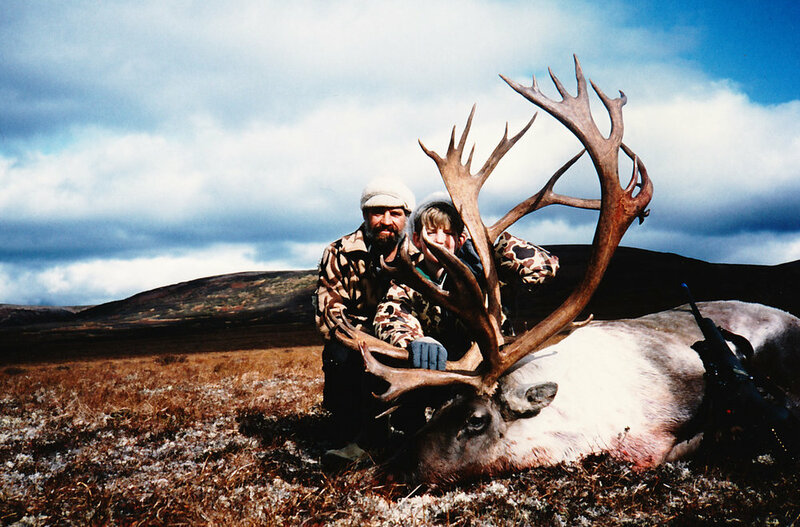 Tim and guide Mike Herbert with his first caribou in '88. This is the kill in AAA's video. Tim hunted caribou for the first time in our Western Alaska area in ’88 and was featured in AAA’s promotional video. He came back four more times trying to take a B&C caribou but it never happened. 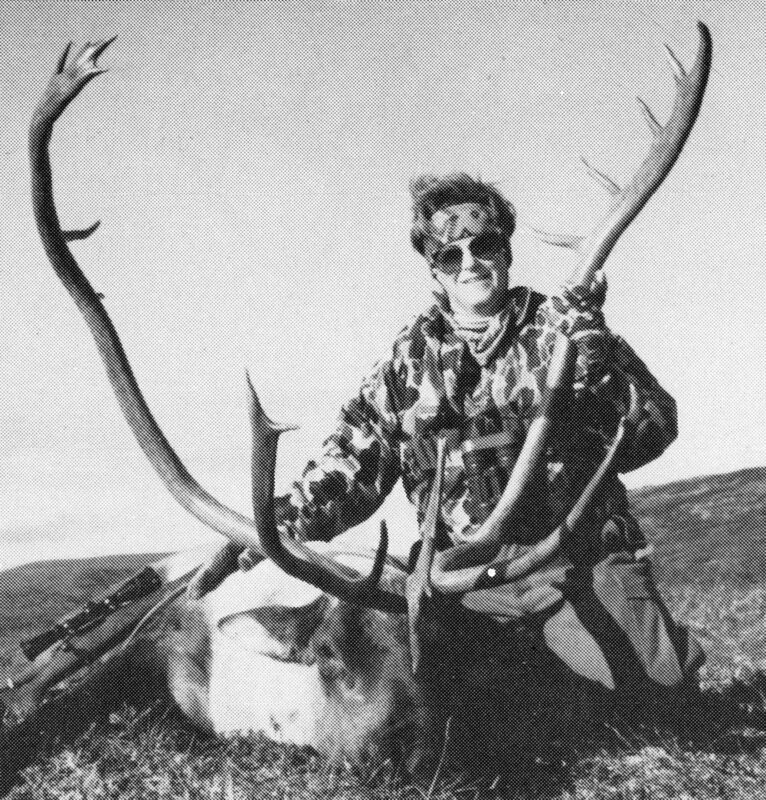 He ended up with four great caribou all over 385 B&C points with the largest being 396 which was only four points shy of the record book. (L to R) Frank, age 9, myself and Tim with two trophy caribou. What fun! Tim with his 396 B&C caribou. During his last spring bear hunt in ’90 Tim and I had discussed bringing his nine year old son, Frank, on a caribou hunt. I told him it shouldn’t be a problem so he brought him that fall. We had a great time with both of them taking really nice trophy caribou. Tim’s scored 389 B&C and Frank’s scored 374 B&C. Marty Phelps, one of our packers, helped me with that hunt. By the time we ended up skinning and taking care of the meat the three mile hike back to spike camp made for a late night. Frank was our second nine year old hunter so he tied for AAA’s all-time record for the youngest hunter. What a great young man. Two years later Tim returned with his wife Kathy, daughter Margaret and son Frank for a family caribou hunt. I had guides, Ron Watts and Marty Phelps, assist me in guiding the four of them. I first met Kathy at the North American Wild Sheep Foundation hunting convention in Reno, NV. She came up to AAA’s booth and said she wanted to book a hunt for her husband. She explained that he was overweight and out of shape. My wife, Karen, was in the booth with me at the time and told me later that I was being really nice when I told Kathy that being out of shape really wasn’t a problem because we had many hunters that fit that description. About that time Tim walked up and I knew that I had been had. We all got a chuckle out of that. What a great sense of humor! Freshwater Adventures flew them into camp on September 20th for their five day hunt. I flew them into a spike camp that we called “Alderville” on the Klutuspak Creek. It was a great camp for many reasons; I could tie the cub down, it had good cover and protection from the wind, it set a hundred feet above the creek and most of the surrounding area but the number one reason was it was right in the middle of the caribou migration path. This was the camp that I used for my first hunter in our Western Alaska area and where my wife had taken her B&C caribou so I was very familiar with the area. The weather was great, clear and cool, which made for great caribou hunting, but without heaters to warm things up it made for a cold kitchen under the tarp. Everyone was a good sport, however. Frank and me with his 399 1/8 B&C caribou. It was a super nice caribou. Margaret and me with her beautiful 385 B&C caribou. She made a great shot! Tim with another trophy caribou scoring 385 B&C points. It had one short point. Without that it would have been a "booner." Kathy with her long beamed caribou. We had caribou in the area from the start but by day two, three and four, they were coming through by the thousands. What a blast! They all took caribou within 500 yards of the camp. Frank, age 11, took the largest scoring 399 1/8 B&C points missing the record book by less than a point. I think Margaret’s, age 12, was around 385 B&C. Tim had told me before they arrived that Margaret had a teacher that was trying to convince her that hunting was bad but her grandmother and other family members were telling her otherwise. This hunt however changed her outlook and to this day she hunts all over the states. She is in the medical field and lives in Montana. Frank who has always liked hunting is a lawyer and works for the family business. The whole family gathered around Frank's giant caribou. What great memories! One funny story about Frank is after they got back to main camp I had measured all of the caribou. The following day I had been flying in the morning checking on other camps. When I returned Kathy told me that Frank had re-added his score sheet and he thought I had made a mistake and that his caribou scored over 400 points making the B&C record book. I said, “Frank you might be right, so let me re-figure.” After going over the numbers it still came out to 399 1/8 the same as before, but I told Frank it was so close he could tell people it was over 400 and no one would ever know. What a wonderful, caring and fun family. I have many great memories of all of the hunts and times that I got to spend with them. Thank you Orton family!